Turn Your Imaginations And Sweet Memories Into Sweet Edible Creations. 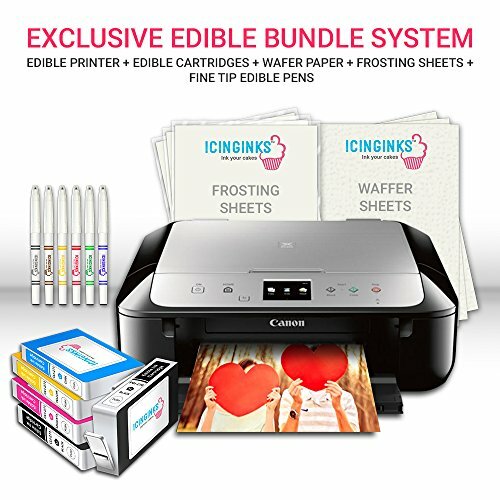 Icinginks Exclusive Edible Printer Bundle Includes: Latest Edible Printer, 20 Wafer Sheets, 5 Icing Sheets, Set of 6 Fine Tip Edible Markers, Refillable Edible Cartridges XL Size With Ink Already Filled. For Cakes the best edible paper is Icing Sheets or Frosting Sheets as they are very white in color, sweet taste and surface is really smooth. These sheets have plastic backing on which layers of Icings are pressed. You will print on icing side of the paper with plastic on the back. Once the image is printed on frosting sheets let it dry for few minutes and remove the plastic backing before applying on a cake. Wafer paper can also be used in cakes but it has dull appearance being the translucent and dull texture of the paper. But these are best to create edible butterflies, to use with Airbrush, creating 3d edible artwork. These sheets do not have any plastic backing. These sheets are little stiff and harder then frosting sheets. Prints Max. up to 8.5" x 11.69" Beautiful & Vivid Color Edible Images, Cake Toppers etc.